Local Chicago Moving Company, We Can Get You There! Moving can be an exciting and stressful time – relieve the stress and hire the most affordable Chicago moving company in the local area! We have have been helping customers like you transport household goods from one place to another in an affordable, safe, and timely manner for more than a decade! Contacting us is just a click away. We are not only one of the best local moving companies, but one of the best long distance relocation services in the nation. Our family-owned-and-operated company is dedicated to providing you with only the best moving services. Our affordable, efficient, and friendly professionals will get your belongings to where they need to be quickly and safely. Whether you are looking for local or long distance, residential or office, Devon can get your belongings where they need to go and have them there when you need them. Would you like to learn more about our Chicago moving services? Click here! Making Your Move Easy – Exceptional Service At Affordable Prices! We are only the best because we listen to you the customer. Our polite and professional staff will do as much or as little as you would like them to. From packing to lifting, our staff makes sure your items are safe throughout the entire transportation process. Rain or shine, we’ll get the job done 24/7, 365. We have used Devon Movers 4 times in the last 5 years and LOVE them. They are quick, efficient, and we never have any casualities with our stuff. They will even help you pack up any of the last little things you have laying around when they get there because your toddler has been "helping" you pack also. We moved from a second story two bedroom apartment to our first home and not only did it take just 4 and a half hours, but they put things down exactly where we wanted them, helped me take apart the crib and move it, and they shrink-wrapped all the furniture at no extra charge. Their travel fee to come to the suburbs is modest at best, MUCH cheaper than other moving companies that have less to travel than they do. We dont plan to move again for awhile but you better believe I will recommend them to anyone who asks and hopefully when it comes time to move again they will still be around and ready to make one of lifes biggest pains super enjoyable. We just moved and used Devon moving, they were wonderful. They were on time and got the job done. What would have taken us all day took them two hours. It was wonderful to move thus time around. This company got the job done at a timely manner and was in and out and set up my furniture as well in my room; I didn't have to do a single thing. I definitely recommend them to anyone and will use them in the future! So great! Totally efficient and SUPER NICE. What a great crew - Henry, Hugo and Mariano were AWESOME. I hired Devon moving to help with a two-day move. We went from one house into storage on the first day, and then on the second, went from storage to a new house. The movers showed up early on the first day and worked a solid 8 hours to get our house empty. The following day, they worked around our closing schedule and showed up with two trucks at 4pm, and the crew went until almost 11. They went above and beyond our highest expectations and we couldnt be more grateful. I would recommend Devon Moving to anyone looking for a great, friendly crew, that works hard and quickly. I have used these guys twice now, once in May 2015 and once again just a few days ago, May 2016. I don't recall the names of the guys I had last year but this time around they sent Phil and Billy to move me from a second floor 2bed with really narrow doors/stairs to a first floor rear apartment. I had high expectations because my last experience with them was so good, and I wasn't disappointed! my movers were friendly and efficient and got the job done in 2.5 hours, even going to far as to disassemble furniture for me as necessary and put it back together at my new place. everything arrived in one piece. there was a little bit of damage to the walls of the place I was moving out of, but with how narrow the stairs are I really don't blame them for that, and anyway that's what deposits are for. I don't intend to move again at any point in the near future, but I will continue to recommend this company to anyone who so much as mentions to me that they're moving. their service is quick, friendly, and affordable, and I am once again pleased with my choice to use Devon Movers! Awesome experience with this company. The movers were very nice and did such an amazing job moving my things without a scratch. They explained everything they were going to move and also helped with more than I had originally planned. Very good price. I definitely recommend this company for anyone who wants to move, quick and efficient service. I had Bill and Frank as my movers and they were GREAT! I was suppose to get 3 men but they must of had a busy day scheduled. I was able to help them out and they treated all my stuff with pride. Thank you and I will be recommending people to your business. This is the first time we used Devon Moving. We used five other moving companies around the country. These guys were the best. They work hard, don't take breaks, arrive on time and stay late. They even sent a fifth man. They disassemble and reassemble large pieces, including a treadmill. And it works perfectly in the basement, which is where we wanted it. This is the first time a moving company did this for us. 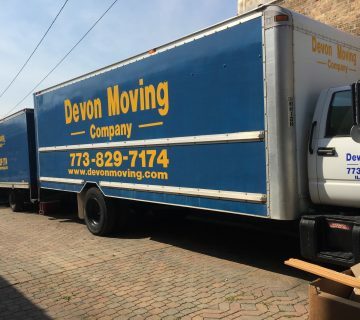 If you are in Chicagoland, I suggest you contact Devon Moving Company. We used Devon Moving company for a last minute move (on Labor Day, no less) from a 2-bedroom apartment to storage. The crew they sent (Juan, Hugo and Joel) were FANTASTIC. They were efficient, careful and friendly. I would recommend these guys to anyone. The office staff person, Erika, was also very professional. This company is not messing around; they want your business, they will do it right and it will be affordable (they explained all charges ahead of time). We will be calling them to move us out of storage at the end of the month! CALL US ANYTIME! (773) 829-7174 for a Quick, Free Estimate!! We have the right truck for your move. We have 14-ft. 18-ft and 24-ft. trucks available in our fleet to help you move as well as all of the dollies you need to securely transport your items. Once everything is in our truck, we make sure everything is in the right position to maximize space and secure everything so that nothing is bouncing around during the travel. If you need a home moving services that goes above and beyond, give us a call. Have us wrap up and protect all of your breakables, valuables, and furniture with our skilled packing services. We’ll make sure every box is labeled so we know what is fragile and what isn’t.